For those who are looking for a happy medium between tent camping and towing a large RV, one of the lightweight tent trailers currently on the market can be an excellent alternative. They are less expensive and easier to tow than traditional recreational vehicles, and most models can be towed by mid-sized automobiles. Voted the "coolest camper ever" by National Geographic gear picks, the Sylvan Sport GO was designed to be the ultimate alternative to RV camping by allowing travelers to carry additional gear. The 840-lb trailer can transport an additional 800 pounds of gear (even when being towed by a compact car), so it's a great option for outdoor adventures who want to carry some kayaks, bikes, canoes or other outdoor gear. This award-winning trailer has a tent that sleeps four (with air mattresses) while allowing seven feet of headroom and an additional 24 cubic feet of internal storage. The Gear Institute rated the unit an 89/100 with top points for versatility, towing ease and design, particularly calling out its "ingenious flexibility as a tent trailer" and saying "the GO solves issues that I didn't even know I was going to have." It's a pretty standard, no-frills unit, which makes it great for novice outdoor enthusiasts or those looking to purchase their first tent trailer as well as to haul their gear, if they can get on board with the price tag. According to Roaming Times, Livin' Lite Recreational Vehicles "...are lightweight tent campers that don't need to be towed by heavy weight pickups, therefore making camping an every family's activity!" The new 2016 Quicksilver 10.0 is a 20-foot unit (14 while being towed) that extends to 8 feet in height and 7 feet across, offering comfortable sleeping accommodations for a family of six. Miller RV Sales boasts, "The ultra lightweight 10.0 Quicksilver automotive camper is the only camper in its class able to sleep six people comfortably." The lighter 'soft top' tent design means more fuel economy while not sacrificing any of the key Quicksilver features, like the 12" aluminum rims, 30AMP power converter, 12V charging station, spare tire and mount and LED tail lights. Decor includes interior dome lights, vinyl floor over inter-locking aluminum floor, zippered windows with day/night shades and a removable dinette set. Plus, the new 2016 decor options - alpine, sierra and cascade- offer customers the ability to customize their unit even more. Customers can also consider the Quicksilver 6.0 or 8.0. 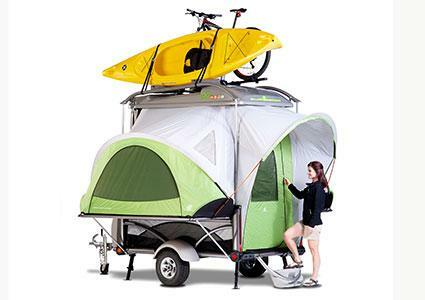 Livin Lite also offers several new 2016 models for truck campers. The company has dealers all across Canada and the US. 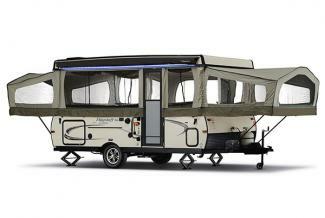 Forest River's Rockwood and Flagstaff models are good lightweight RVs to consider. 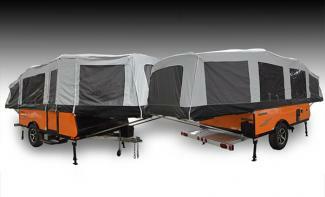 The Flagstaff Classic is one of the top units on the market, and both models are lauded by Trailer Life. They are a hit with customers who continually say that they love their unit. 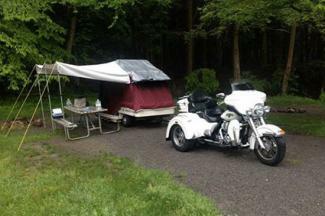 For example, one owner said, "I'm on my second Forest River camper. I liked my Rockwood so much that when I upgraded I bought a Flagstaff." There are several different series available for each of these trailers, including the basic, sports, high wall and mac series (for Flagstaff) and the freedom, extreme, premier and high wall series (for Rockwood). Customers can fully customize the unit to fit their specific needs, whether that includes optimization for carrying sports equipment or going with the most basic unit. There are also "add a room" options and floor plans available in both pop-up and A-frame units. The high wall style saves a lot of weight over hard-sided trailers. There are a number of Forest River dealers available. Lees-ure Lite was started by cyclists in 1972 to create something they could tow with their bikes. The smallest and most affordable unit included in this list, the Tiny Tent Trailer is a good option for singles or couples who are happy with a bare-bones, dependable unit. The new 2015 Excel unit is based on the company's original design, consistently reworked to include more width (it now has a double bed capacity). It's 11 inches long, with 30 cubic feet of storage, 6 feet 4 inches of headroom, and options like an adjustable cooler rack and storage pod. Lite Tent Camper, LLC says the camper offers "simplicity without compromise" and this model is consistently lauded for its easy set-up. The unit is built on a steel frame with a carpeted fiberglass tube, so it's sturdy while also being lightweight enough to be towed by almost any vehicle. Whether you're a single camper looking for the freedom to find the perfect spot to camp, or a family who wants to deck-out a vacation spot without having to tow an expensive and heavy trailer, tent trailers are a great alternative that can help personalize your camping experience.